Every living organism needs energy. Some organisms (known as producers) create their own organic compounds, which can be converted into energy. Other organisms (known as consumers) consume other organisms (animals or plants) for their organic compounds. The transfer of energy from one organism to another can be represented by food chains and webs. 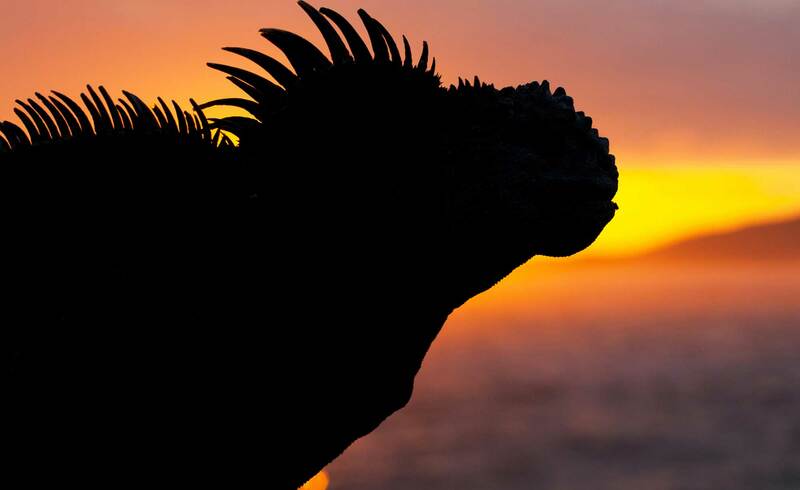 Play our interactive activity to find out who eats who in the Galapagos. 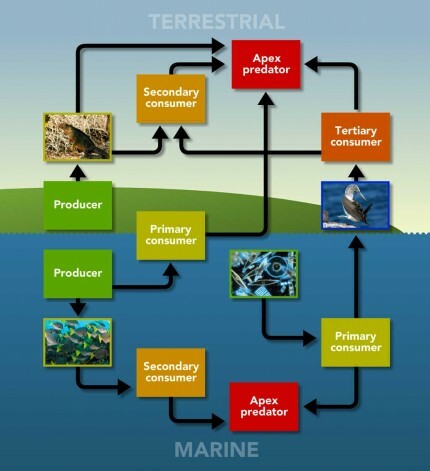 A food chain shows the linear transfer of energy from producers to consumers. Each organism in the food chain eats the organism below it and is eaten by the organism above it. Each step in the chain is known as trophic level. The first organism in a food chain is always a producer, which provides energy in the form of organic compounds to support organisms further up the food chain. Plants create organic compounds by using sunlight, carbon dioxide and water to photosynthesise. When the producer is eaten, this energy is transferred up the food chain to a primary consumer. The primary consumer is then consumed by a secondary consumer, and so on. The transfer of energy up the food chain stops at the highest tropic level with the apex predator, which has no predator of its own. A food chain visualises energy transfer linearly, from one organism to another. But ecosystems are rarely this simple. Organisms often consume and are consumed by more than one other organism. 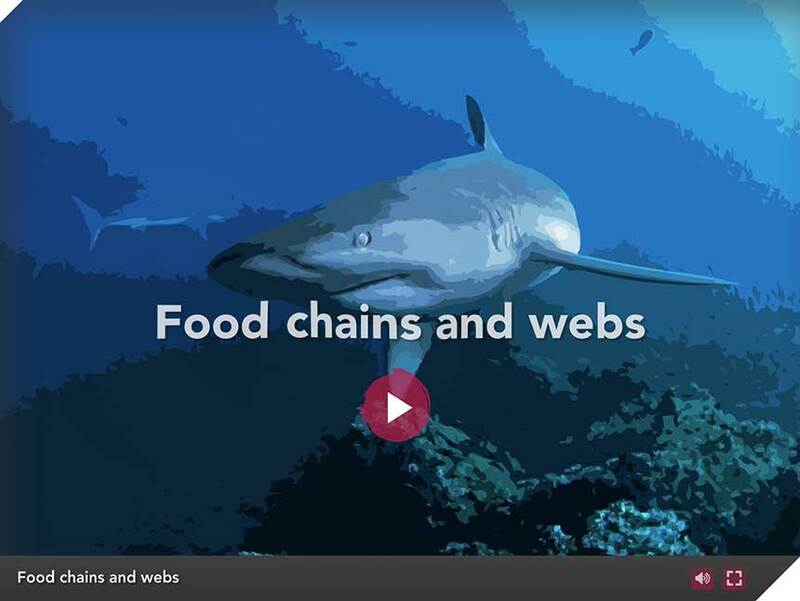 Food webs show the more complex interactions between a range of organisms in an ecosystem. The transfer of energy from one organism to another is not efficient and a large proportion of energy is lost in the process. Typically, only 10% of energy is transferred from one trophic level to the next. The remaining 90% is used in metabolic activity, such as breathing, digestion and the transport of substances between cells. Because energy decreases with each trophic level, biomass – the mass of all living organisms in an ecosystem – also decreases with each stage in the food chain. This means that the mass of apex predators in an ecosystem will be much less than the mass of producers in that ecosystem. Due to the loss of energy and reduction in biomass, food chains are limited to a maximum of six trophic levels.